Dec. 2, 2018, 1 p.m.
Join us for A Day of Inclusion. An all-day interactive exhibit gives you the rare opportunity to see the strengths and abilities of exceptional individuals in visual form. Wander around and be inspired. Experience our very own advocacy corner and model sensory room. Stop in for the simulated exhibits to experience innovative and hands-on experiences of life through the eyes of our community members with exceptional needs. Join the panel of experts, as we dive through a discussion on creating inclusive spaces for our community. All ages welcome. 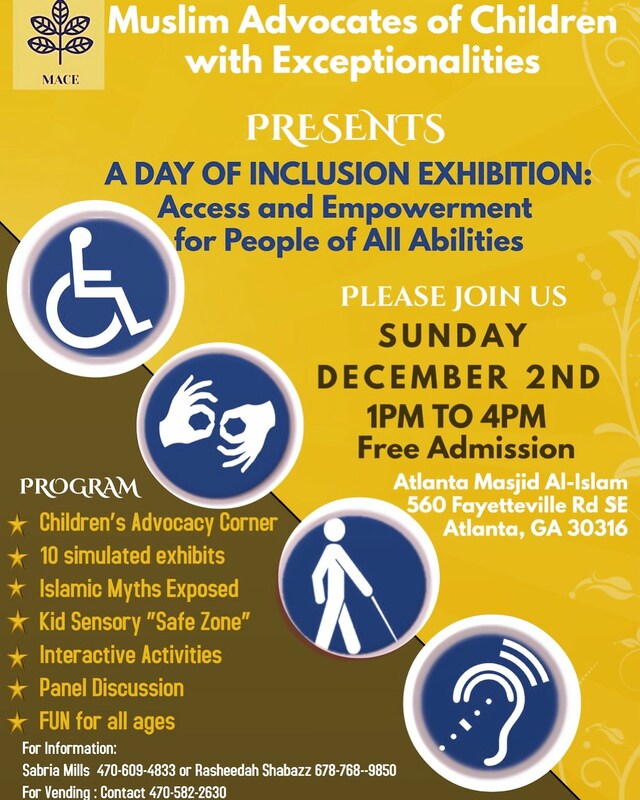 Highlighted exhibits include: Autism, ADHD, Dyslexia, Visual and Hearing Impairments, and so much more! Contact Details: Sabria Mills 470-609-4883/Rasheedah Shabazz 678-768-9850 or email maceinfo2028@gmail.com. Edit This Event Last Edited By: Sabria Mills on Nov. 10, 2018, 7:53 p.m.